It’s no secret. I love to eat. In fact, one of the things I most enjoy about travel is the opportunity to eat local food. And it’s no different when I’m in my hometown of Los Angeles. So, what did I do over President’s Day weekend? I ate. A lot. 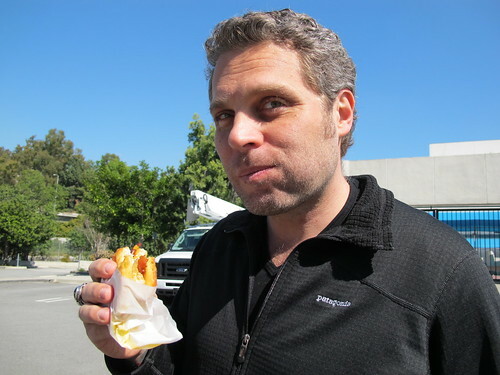 There are tons of food trucks in Los Angeles and I’ve been to my fair share. Some are worth writing about. Some, unfortunately, are not. I’ll spare you the ones that don’t deliver the goods. 5.) The Grilled Cheese Truck – I know, I know, a lot of websites rank this place number one and the crazy long lines certainly support that ranking, but in my opinion, they are squeakin’ in at number five. Still quite respectable. The S’more melt with marshmallow cream, Nutella and crumbled graham crackers which looks so decadently inviting on their website is not worth the drive nor the $5 price tag. However, the Cheesy Mac and Rib is a real winner. 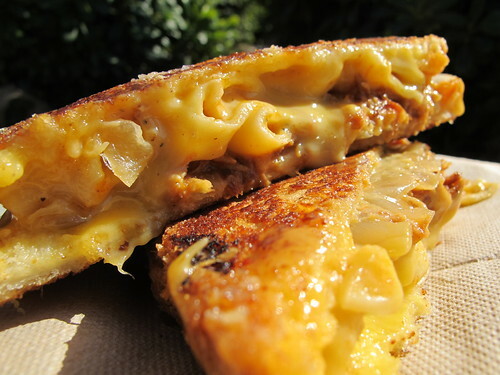 The sweet BBQ pork and caramelized onions are the perfect counterpart to the gooey cheesy goodness of this sandwich. 4.) Buttermilk – If breakfast is your favorite meal (and it is mine! ), you need to check this spot out. Heck, you can even have dessert for breakfast here. 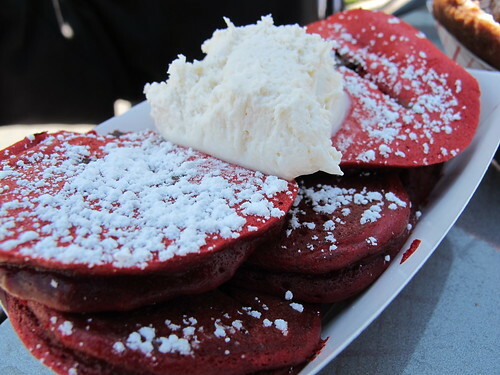 If you get the Red Velvet Chocolate Chip Pancake Bites, I guarantee you will not be disappointed. If that deliciousness isn’t enough for you, they also have Hawaiian Bread Cinnamon French Toast Sticks and Housemade Cake Donuts. I’m getting a sugar buzz and a carb high just writing this! 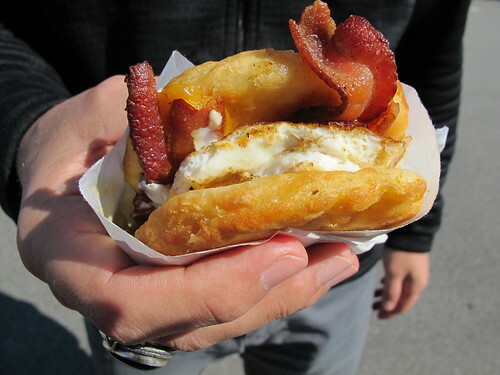 If Savory is your thing, then the Buttermilk Biscuit Breakfast Sandwich is the way to go. With the yolk still runny, it’s the perfect egg sandwich. 3.) Grill ‘Em All – With a name like that, these guys better create some seriously rockin’ burgers. And they do! Do not come here without your appetite. This is not a place to have a light snack. These burgers are made with 7oz. patties and topped with heaps of crazy and delicious things. Nothing here is frozen or pre-made. These guys rock it out fresh every day. Okay, I highly recommend “The Behemoth”. This thing is ridiculous and amazing and I was addicted after the first bite. What sort of madman conceived this masterpiece? 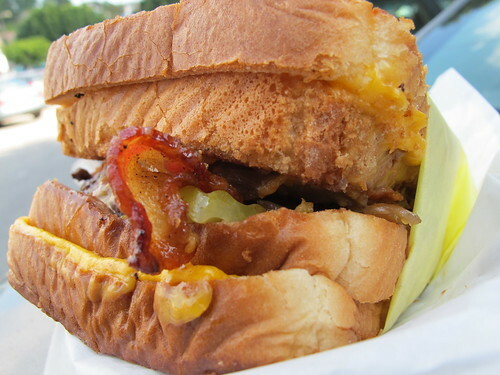 I mean instead of using buns, this burger is sandwiched between two grilled cheese sandwiches. This is definitely where I’m going if I ever need to put on a lot of weight really fast. 2.) 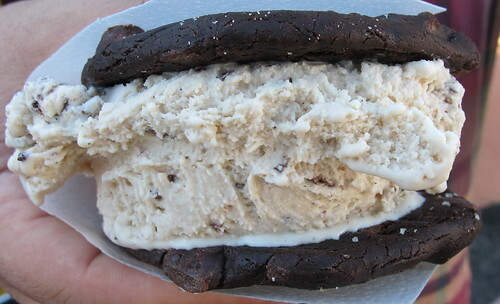 Coolhaus – They call themselves an architecturally themed ice-cream truck and they have some serious masterpieces. Your ice-cream sandwich is constructed in two steps. First, choose a cookie. 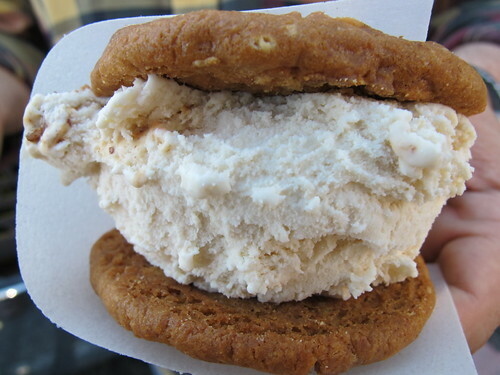 With flavors like apple fritter, peanut butter banana, snicker-doodle and ginger molasses this can prove challenging. Next, select your ice-cream. I have to mention, while the cookies are great, the ice-cream is the standout. Some of the delicious flavors you’ll encounter are: Brown Butter and Candied Bacon, Balsamic Fig and Mascarpone, Guinness Chip, Thai Iced-Tea, Orange Chocolate Cointreau, Horchata, and Red Velvet. Have fun experimenting! 1.) Taco Zone – This truck is by far my favorite food truck in all the land. It makes the most perfect Suadero. What is Suadero? Suadero is BBQ Beef brisket and you need to get you some. Did that even make any sense? 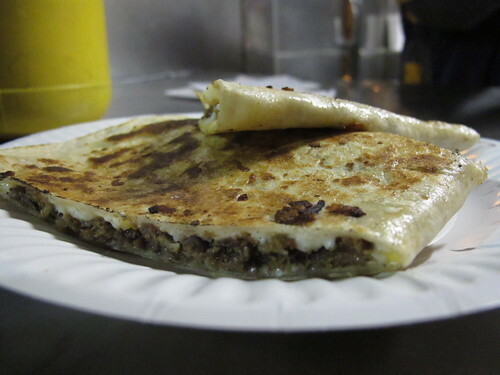 The carnitas, lengua, and al pastor are all very good here, however, THE thing to order is the suadero quesadilla. Give it a try and let me know what you think. This thing has made vegetarians go to the dark side. Even if only for one night. The truck generally parks on Alvarado Blvd. two blocks north/east of Sunset near the Vons parking lot. Don’t forget to grab some salsa. I prefer the verde, but they are all good. 7 p.m. to midnight Sun.-Thurs. and 7 p.m. to 2 a.m. Fri.–Sat. Find LA Food Trucks – Like it says, this site will help you find where the trucks are on any given day. This site has all the tweets in one convenient place so you don’t have to go to each trucks individual site. Of course, you could also just follow the trucks that you like on twitter and only receive their updates. This site also has a nice blog about the trucks so you know what to expect. Mobile Cravings – This site has the trucks ranked according to popularity with links to the trucks websites. If you know of a truck in the LA area that you think rocks, leave a comment and let me know the name of the truck and what your favorite food is from there and I’ll be sure to give it a try. This entry was posted	on Tuesday, February 22nd, 2011 at 11:44 pm	and is filed under Los Angeles, Places. You can follow any responses to this entry through the RSS 2.0 feed. You can leave a response, or trackback from your own site. You are in luck. Kogi has 5 trucks and they are up in the LA area also. 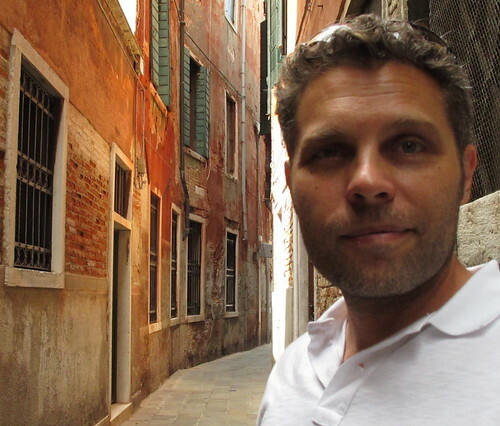 They can often be found in Venice at the Brig, sometimes downtown, glendale, eagle rock and even Sunset Junction. I’ve eaten at one in the parking lot of the 4100 Club after a night of drinks. I believe The Lime Truck is an OC phenomenon, so you may have to find a replacement for that one! Or get used to a bit of a drive for that fix. Anyhow, lots of great trucks to try. What are your favorite dishes at Kogi and The Lime Truck? Short-rib kimchee tacos at Kogi (I drooling just thinking of them) and the Ultimate Tacos (“10 hour pork”) at the Lime Truck – The Lime Truck is interesting, though, because they offer continually rotating daily specials, so I’ve had some great stuff there that isn’t on the regular menu. Yummm! Omg this post is making me hungry! What was the taco truck that we went to after one of Andrew and Ian’s gigs at Taix. It was a block or two away. Was that taco zone? That was indeed Taco Zone! Always perfect after a night out. There is a crepe and wine restaurant in San Diego, can’t remember the name, that also has a truck for fairs and festivals. Some of the best food I’ve ever had. I had a breakfast Florintine crepe that was heaven on my tongue!! Everything was made to order and neatly packaged for walking while eating. Really?? Coolhaus made #2? I’ll admit they have some creative flavors (orangebolossom is one of my favorites) and tasty cookies, but the ice-cream quality varies considerably, and I feel like most of the cookies are way to thick and sweet for the intended combination. Nonetheless, it does make for quite the presentation, and I love the Architectural twist. 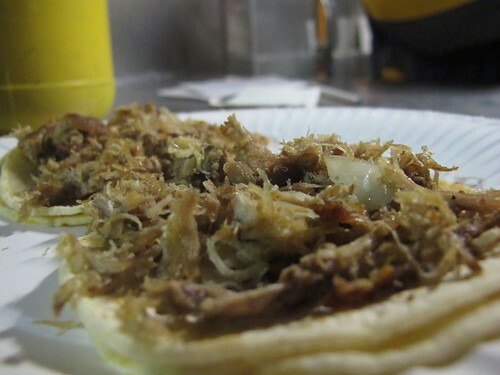 My favorite 3 are Cemitas Poblanos, Kogi, and I hate to admit The Flying Pig. These should be on everyone’s bucket list. Cemitas Poblanos is old school working class. It’s the only truck I’ve come across that has proper hand made tortillas. The result is a slightly thicker dough that must be made with lard… It’s delicious. And, the salsas are ridiculous; I want to drink a vat of the avocado based one. Also, the meat is rarely overcooked, just a thought since I’ve had carne asada from Taco Zone that was so dry and stringy I could floss with it. Kogi is worth the twitter trekk. The ground-breaking Korean BBQ tacos are brilliant. The fresh kimi chi is a perfect tart and spicy compliment to perfectly seared meats. I endorse anything these guys do to a short-rib. 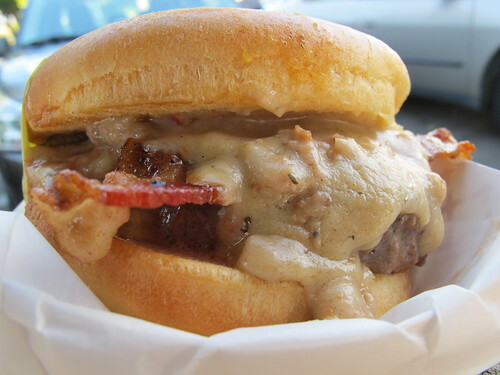 Also not to be missed, the sliders will make you cry… Don’t even try to share an order. I threw in the Flying Pig because I can never make myself pass up their pork belly bun. Although I’ve been consistently disappointed with the Tamarind Duck Taco (I keep retrying it because the sauce is so damned good despite the dessicated grease pile they try to pass off as duck), they do the best pork belly in LALA land. The bun/tortilla… meh, but at least it’s not too awkward to eat on the side of the road on a bar crawl.